As 2009 closed, I wrote a post about Final Cut Studio as the center of a boutique post production workflow. A lot has changed since then, but that approach is still valid and a number of companies can fill those shoes. In each case, rather than be the complete, self-contained tool, the editing application becomes the hub of the operation. Other applications surround it and the workflow tends to go from NLE to support tool and back for delivery. Here are a few solutions. No current editing package comes as close to the role of the old Final Cut Studio as does Adobe’s Creative Cloud. You get nearly all of the creative tools under a single subscription and facilities with a team account can equip every room with the full complement of applications. When designed correctly, workflows in any room can shift from edit to effects to sound to color correction – according to the load. In a shared storage operation, projects can stay in a single bay for everything or shift from bay to bay based on operator speciality and talent. While there are many tools in the Creative Cloud kit, the primary editor-specific applications are Premiere Pro CC, After Effects CC and Audition CC. It goes without saying that for most, Photoshop CC and Adobe Media Encoder are also givens. On the other hand, I don’t know too many folks using Prelude CC, so I can’t say what the future for this tool will be. 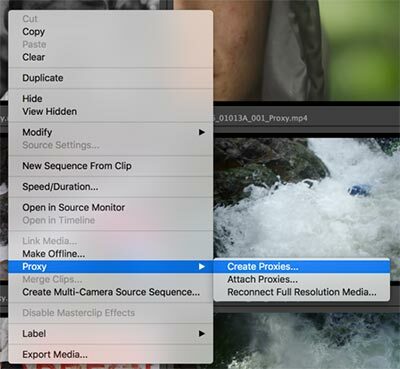 Especially since the next version of Premiere Pro includes built-in proxy transcoding. Also, as more of SpeedGrade CC’s color correction tools make it into Premiere Pro, it’s clear to see that SpeedGrade itself is getting very little love. The low-cost market for outboard color correction software has largely been lost to DaVinci Resolve (free). For now, SpeedGrade is really “dead man walking”. I’d be surprised if it’s still around by mid-2017. That might also be the case for Prelude. Many editors I know that are heavy into graphics and visual effects do most of that work in After Effects. With CC and Dynamic Link, there’s a natural connection between the Premiere Pro timeline and After Effects. A similar tie can exist between Premiere Pro and Audition. I find the latter to be a superb audio post application and, from my experience, provides the best transfer of a Premiere Pro timeline into any audio application. This connection is being further enhanced by the updates coming from Adobe this year. Rounding out the package is Photoshop CC, of course. While most editors are not big Photoshop artists, it’s worth noting that this application also enables animated motion graphics. For example, if you want to create an animated lower third banner, it can be done completely inside of Photoshop without ever needing to step into After Effects. Drop the file onto a Premiere Pro timeline and it’s complete with animation and proper transparency values. Update the text in Photoshop and hit “save” – voila the graphic is instantly updated within Premiere Pro. Given the breadth and quality of tools in the Creative Cloud kit, it’s possible to stay entirely within these options for all of a facility’s post needs. Of course, roundtrips to Resolve, Baselight, ProTools, etc. are still possible, but not required. Nevertheless, in this scenario I typically see everything starting and ending in Premiere Pro (with exports via AME), making the Adobe solution my first vote for the modern hub concept. Apple walked away from the market for an all-inclusive studio package. Instead, it opted to offer more self-contained solutions that don’t have the same interoperability as before, nor that of the comparable Adobe solutions. 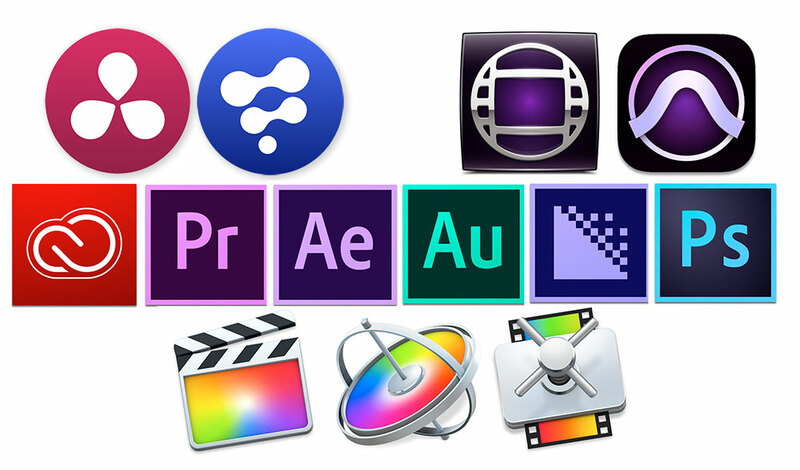 To build up a similar toolkit, you would need Final Cut Pro X, Motion, Compressor and Logic Pro X. An individual editor/owner would purchase these once and install these on as many machines as he or she owned. A business would have to buy each application for each separate machine. So a boutique facility would need a full set for each room or they would have to build rooms by specialty – edit, audio, graphics, etc. Even with this combination, there are missing links when going from one application to another. These gaps have to be plugged by the various third-party productivity solutions, such as Clip Exporter, XtoCC, 7toX, Xsend Motion, X2Pro, EDL-X and others. These provide better conduits between Apple applications than Apple itself provides. 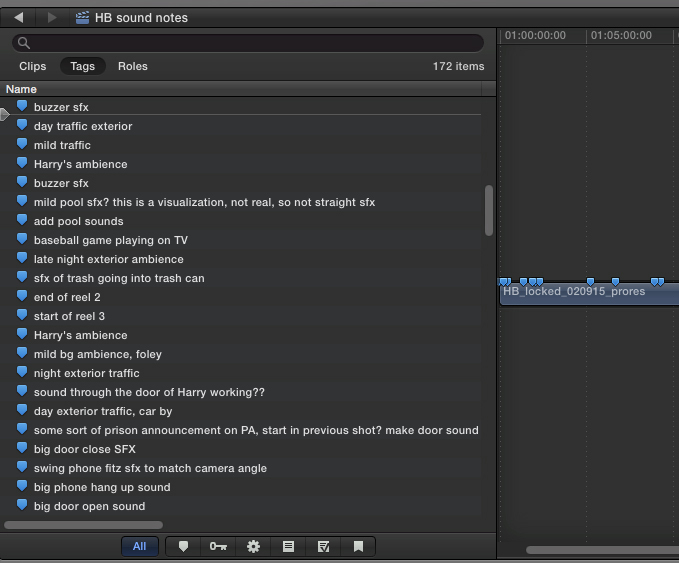 For example, only through Automatic Duck Xsend Motion can you get an FCPX project (timeline) into Motion. Marquis Broadcast’s X2Pro Audio Convert provides a better path into Logic than the native route. If you want the sort of color correction power available in Premiere Pro’s Lumetri Color panel, you’ll need more advanced color correction plug-ins, like Hawaiki Color or Color Finale. Since Apple doesn’t produce an equivalent to Photoshop, look to Pixelmator or Affinity Photo for a viable substitute. Although powerful, you still won’t get quite the same level of interoperability as between Photoshop and Premiere Pro. Naturally, if your desire is to use non-Apple solutions for graphics and color correction, then similar rules apply as with Premiere Pro. For instance, roundtripping to Resolve for color correction is pretty solid using the FCPXML import/export function within Resolve. Prefer to use After Effects for your motion graphics instead of Motion? Then Automatic Duck Ximport AE on the After Effects side has your back. Most of the tools are there for those users wishing to stay in an Apple-centric world, provided you add a lot of glue to patch over the missing elements. Since many of the plug-ins for FCPX (Motion templates) are superior to a lot of what’s out there, I do think that an FCPX-centric shop will likely choose to start and end in X (possibly with a Compressor export). 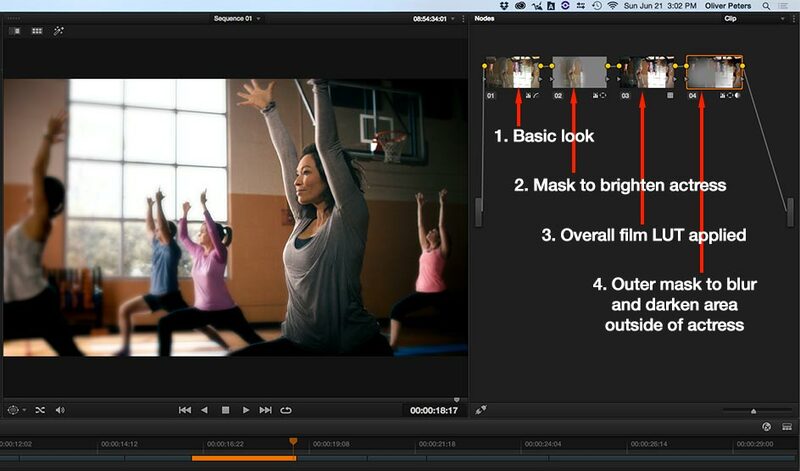 Even when Resolve is used for color correction, I suspect the final touches will happen inside of Final Cut. It’s more of the Lego approach to the toolkit than the Adobe solution, yet I still see it functioning in much the same way. 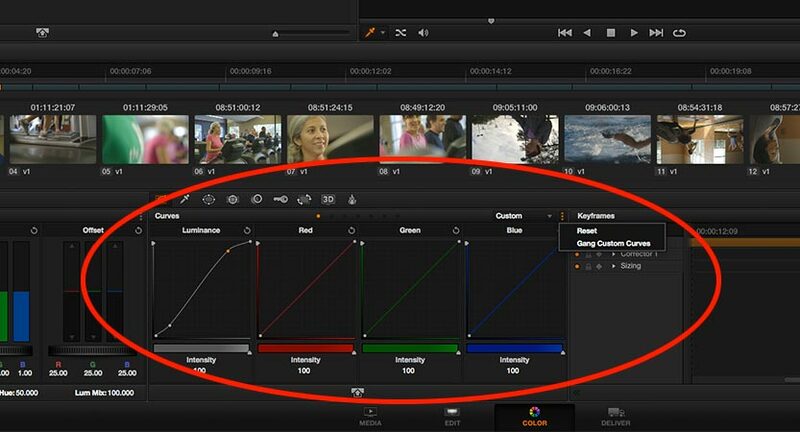 It’s hard to say what Blackmagic’s end goal is with Resolve. Clearly the world of color correction is changing. Every NLE developer is integrating quality color correction modules right inside of their editing application. So it seems only natural that Blackmagic is making Resolve into an all-in-one tool for no other reason than self-preservation. And by golly, they are doing a darn good job of it! Each version is better than the last. 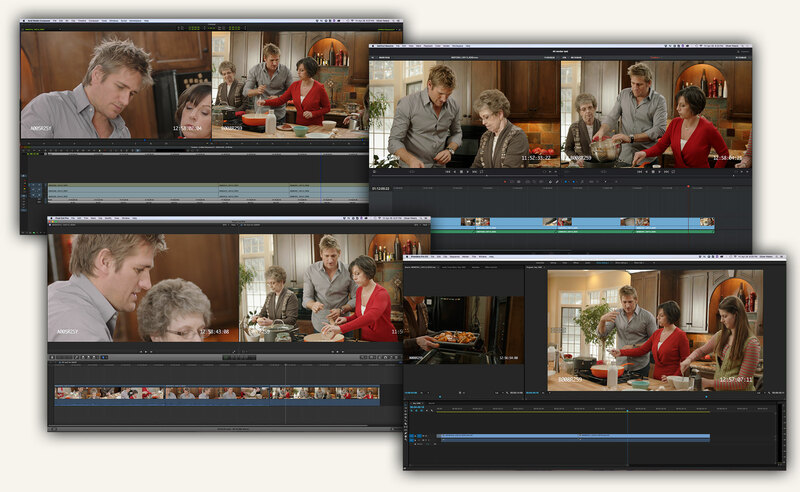 If you want a highly functional editor with world-class color correction tools for free, look no further than Resolve. 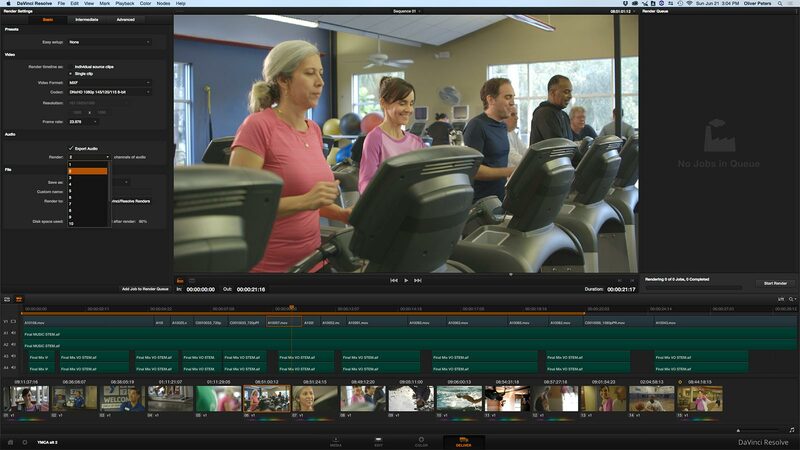 Ingest, transcoded and/or native media editing, color correction, mastering and delivery – all there in Resolve. There are two weak links – graphics and audio. On the latter front, the internal audio tools are good enough for many editors. However, Blackmagic realizes that specialty audio post is still the domain of the sound engineering world, which is made up predominantly of Avid Pro Tools shops. To make this easy, Resolve has built-in audio export functions to send the timeline to Pro Tools via AAF. There’s no roundtrip back, but you’d typically get composite mixed tracks back from the engineer to lay into the timeline. To build on the momentum it started, Blackmagic Design acquired the assets of EyeOn’s Fusion software, which gives then a node-based compositor, suitable for visual effects and some motion graphics. This requires a different mindset than After Effects with Premiere Pro or Motion with Final Cut Pro X (when using Xsend Motion). You aren’t going to send a full sequence from Resolve to Fusion. Instead, the Connect plug-in links a single shot to Fusion, where it can be effected through series of nodes. The Connect plug-in provides a similar “conduit” function to that of Adobe’s Dynamic Link between Premiere Pro and After Effects, except that the return is a rendered clip instead of a live project file. To take advantage of this interoperability between Resolve and Fusion, you need the paid versions. Just as in Apple’s case, there really is no Blackmagic-owned substitute for Photoshop or an equivalent application. You’ll just have to buy what matches your need. While it’s quite possible to build a shop around Resolve and Fusion (plus maybe Pro Tools and Photoshop), it’s more likely that Resolve’s integrated approach will appeal mainly to those folks looking for free tools. I don’t see too many advanced pros doing their creative cutting on Resolve (at least not yet). However, that being said, it’s pretty close, so I don’t want to slight the capabilities. Where I see it shine is as a finishing or “online” NLE. 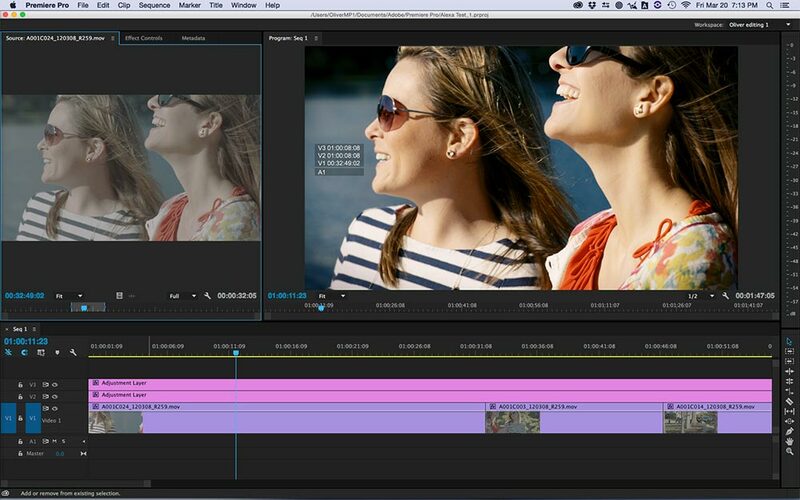 Let’s say you perform the creative or “offline” edit in Premiere Pro, FCPX or Media Composer. This could even be three editors working on separate segments of a larger show – each on a different NLE. Each’s sequence goes to Resolve, where the timelines are imported, combined and relinked to the high-res media. The audio has gone via a parallel path to a Pro Tools mixer and graphics come in as individual clips, shots or files. 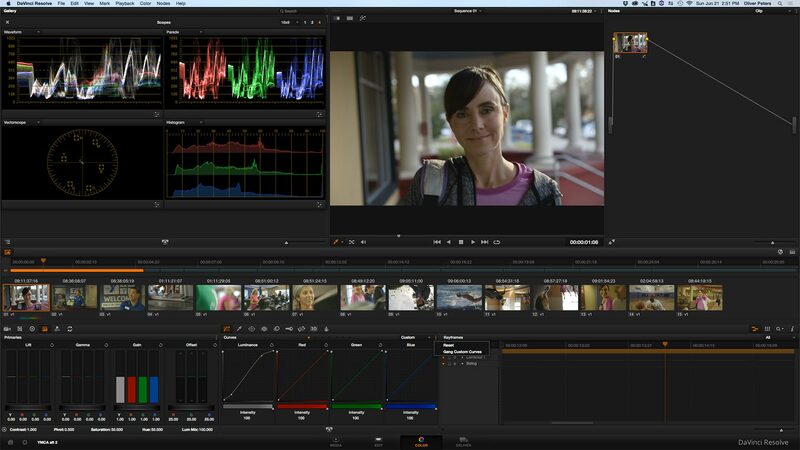 Then all is combined inside Resolve, color corrected and delivered straight from Resolve. For many shops, that scenario is starting to look like the best of all worlds. I tend to see Resolve as less of a hub than either Premiere Pro or Final Cut Pro X. Instead, I think it may take several possible positions: a) color correction and transcoding at the front end, b) color correction in the middle – i.e. 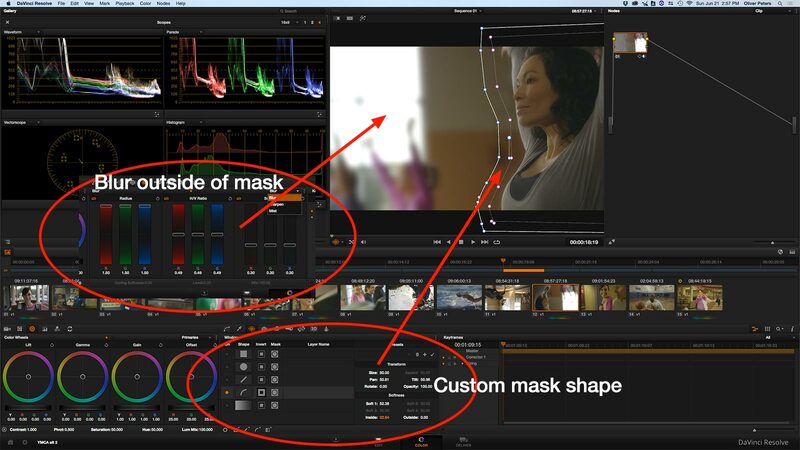 the standard roundtrip, and/or c) the new “online editor” for final assembly, color correction, mastering and delivery. This brings me to Avid Media Composer, the least integrated of the bunch. You can certainly build an operation based on Media Composer as the hub – as so many shops have. But there simply isn’t the silky smooth interoperability among tools like there is with Adobe or the dearly departed Final Cut Pro “classic”. However, that doesn’t mean it’s not possible. You can add advanced color correction through the Symphony option, plus Avid Pro Tools in your mixing rooms. In an Avid-centric facility, rooms will definitely be task-oriented, rather than provide the ease of switching functions in the same suite based on load, as you can with Creative Cloud. The best path right now is Media Composer to Pro Tools. Unfortunately it ends there. 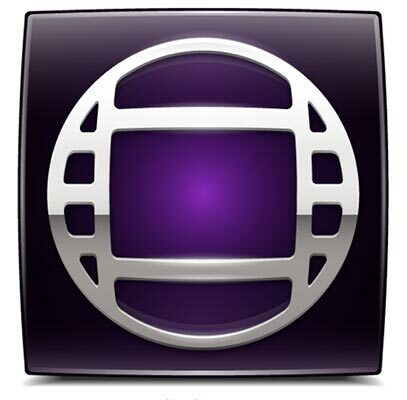 Like Blackmagic, Avid only offers two hero applications in the post space – Media Composer/Symphony and Pro Tools. They have graphics products, but those are designed and configured for news on-air operations. This means that effects and graphics are typically handled through After Effects, Boris RED or Fusion. Boris RED runs as an integrated tool, which augments the Media Composer timeline. However, RED uses its own user interface. That operation is relatively seamless, since any “roundtrip” happens invisibly within Media Composer. 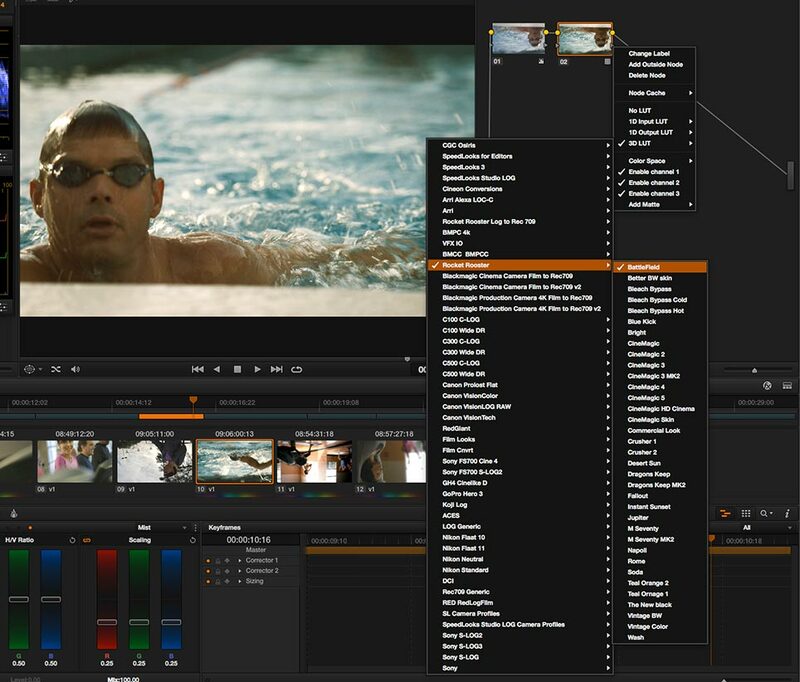 Fusion can be integrated using the Connect plug-in, just like between Fusion and Resolve. Automatic Duck’s AAF import functions have been integrated directly into After Effects by Adobe. It’s easy to send a Media Composer timeline into After Effects as a one-way trip. In fact, that’s where this all started in the first place. Finally, there’s also a direct connection with Baselight Editions for Avid, if you add that as a “plug-in” within Media Composer. As with Boris RED, clips open up in the Baselight interface, which has now been enhanced with a smoother shot-to-shot workflow inside of Media Composer. While a lot of shops still use Media Composer as the hub, this seems like a very old-school approach. Many editors still love this NLE for its creative editing prowess, but in today’s mixed-format, mixed-codec, file-based post world, Avid has struggled to keep Media Composer competitive with the other options. There’s certainly no reason Media Composer can’t be the center – with audio in Pro Tools, color correction in Resolve, and effects in After Effects. However, most newer editors simply don’t view it the same way as they do with Adobe or even Apple. Generally, it seems the best Avid path is to “offline” edit in Media Composer and then move to other tools for everything else. So that’s post in 2016. Four good options with pros and cons to each. Sorry to slight the Lightworks, Vegas Pro, Smoke/Flame and Edius crowds, but I just don’t encounter them too often in my neck of the woods. In any case, there are plenty of options, even starting at free, which makes the editing world pretty exciting right now. In the last post I questioned the visual value of 4K. However, it’s inevitable that more and more distributors will be asking for 4K deliverables, so you might as well start planning how you are going to achieve that. There are certainly plenty of demos showing how easy it is to edit 4K content and they use iPhone video for the demo material. The reality is that such footage is crap and should only be used when it’s the only camera available. At the low end, there are plenty of cameras to choose from that work with highly-compressed 4K images and yet, yield great results. The Blackmagic Design URSA Mini, Sony FS7 and Canon C300 Mark II come to mind. Bump up to something in a more cinema-style package and you are looking at a Sony F55, RED, ARRI or even the AJA CION. While many cameras record to various proprietary compressed codecs, having a common media codec is the most ideal. Typically this means Apple ProRes or Avid DNxHD/HR. Some cameras and standalone monitor/recorders can natively generate media in these formats. In other circumstances, it requires an interim transcode before editing. This is where system throughput becomes a big issue. For example, if you want to work with native 4K material as ProRes 4444, you are going to need fast drives. On my home Mac Pro tower, I have two internal 7200RPM spinning drives for media striped as RAID-0. In addition to these and the boot drive, I also have another internal SSD media drive. When I checked their relative performance with the AJA System Test utility, these clocked at 161 write /168 read for the RAID-0 stripe and 257/266 for the single SSD. That’s good enough for approximately 27fps and 43fps respectively, if the media were large 3840 x 2160 (2160p) ProRes 4444 files. In other words, both drive units are adequate for a single stream of 2160p/23.98 as ProRes 4444, but would have a tougher time with two streams or more. Unfortunately the story doesn’t end with drive performance alone, because some NLEs handle real-time playback of 4K media better than do others. I’ve performed a number of tests with 4K files in Apple Final Cut Pro X, Adobe Premiere Pro CC, Avid Media Composer and Blackmagic Design DaVinci Resolve. This has been on a number of different units, including a couple of Mac Pro towers, as well as a newer “trash can” Mac Pro. Plus, I’ve run tests with local drives, attached media RAIDs, and network-attached storage systems. What I’ve found is that as long as you have fast drive performance, then the bottleneck is the NLE. Pretty much all of these choices can handle a single stream of 4K media without too much of an issue. However, when you stack up a second layer or track for a simple 2D PIP composite, generally the system struggles. In some cases, FCPX has performed better than the others, but not consistently. The others all choked to varying degrees. When you limit it to a single stream of 4K video with associated audio, then FCPX performs more fluidly at a higher quality level than Media Composer or Premiere Pro, although Media Composer also performed well in some of the tests. My conclusion, for now, is that if you want to work with native 4K media in a client-involved session, and with the least amount of rendering, then FCPX is the clear winner – at least on the Mac platform. For many editors it will be the most viable choice. The first big plus for Final Cut Pro X is how easily it works with native media that it’s compatible with. That’s one thing I don’t generally advocate on a large project like a show or feature film – opting instead to create “optimized” media first, either externally or within FCPX. Nevertheless, a lot of native codecs can be quite easy on the system. For example, one client cut an indie feature, using all native camera files from his Sony FS7. His Final Cut system was a tricked out iMac that was a couple of years old and a Promise Pegasus RAID array. Initially he cut the film from native 4K FS7 files to an FCPX 1080p timeline. I was doing the grading in Resolve, so I had him export a single, flattened movie file from the timeline as 1080p ProRes 4444. 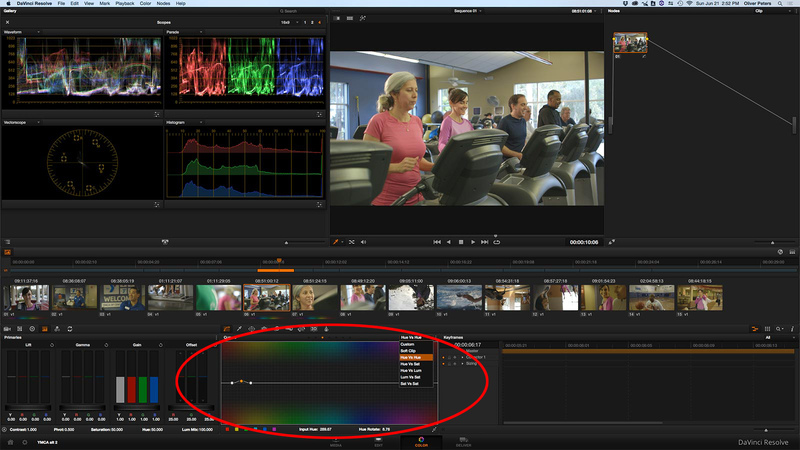 I brought this into Resolve, “bladed” the cuts to create edit points and applied my color correction. I exported a single ProRes 4444 master file, which he could import back into FCPX and marry with the post-production mix. Fast forward a year and the film distributor was inquiring whether they could easily produce a 4K master instead of a 1080 master. This turned out to be relatively simple. All my client had to do was change his FCPX project (timeline) settings to 4K, double-check the scaling for his clips and export a new 4K ProRes 4444 file of the timeline. In Resolve, I also changed the timeline setting to 4K and then relinked to the new 4K file. Voila! – all the cuts lined up and the previous grades all looked fine. Then I simply exported the graded 4K file to send back to the client. In this example, even with a roundtrip to Resolve and a change from 1080p to 2160p, FCPX performed perfectly without much fuss. However, for many, you wouldn’t even need to go this far. Depending on how much you like to play and tweak during the color grade, there are plenty of ways to do this and stay totally inside FCPX. You could use tools like the Color Board, Hawaiki Color, Color Finale, or even some home-brew Motion effects, and achieve excellent results without ever leaving Final Cut Pro X. As a reminder, Media Composer, Premiere Pro CC and Resolve are all capable of working with native media, including 4K. In addition to native 4K post, Apple engineers built an ingenious internal proxy workflow into Final Cut. Transcode the camera files in the background, flip a toggle, and work with the proxy files until you are ready to export a master. When you opt to transcode proxies, FCPX generates half-resolution, ProRes Proxy media corresponding to your original files. 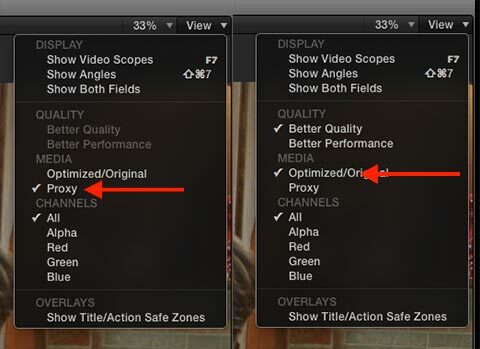 As an example, if your media consists of 2160p XAVC camera files, FCPX creates corresponding 1080p ProRes Proxy files. Even though the proxy media’s frame is 1/4th the size of the 4K original, FCPX takes care of handling the scaling math in the timeline between original and proxy media. The viewer display will also appear very close in quality, regardless of whether you have switched to original/optimized or proxy media. The majority of legacy A/V output cards, like a Blackmagic Design Decklink, are only capable of displaying SD and HD content to an external monitor. FCPX can send it the proper data so that a 4K timeline is displayed as a scaled 1080 output to your external video monitor. Although proxies are small for a 4K project, these are still rather large to be moving around among multiple editors. It’s not an official part of the Final Cut operation, but you can replace these generated proxies with your own versions, with some caveats. Let’s say you have 3840 x 2160, log-gamma-encoded, 4K camera files. You would first need to have FCPX generate proxies. However, using an external application such as EditReady, Compressor, etc, you could transcode these camera files into small 960×540 ProRes Proxy media, complete with a LUT applied and timecode/clip name burnt in. Then find your Proxy Media folder, trash the FCPX-generated files and replace them with your own files. FCPX should properly relink to these and understand the correct relationship between the original and the proxy files. (This post explains the process in more detail.) There are several caveats. Clip name, frame rate, clip length, aspect ratio, and audio channel configurations must match. Otherwise you are good to go. The benefit to this solution is that you can freely edit with the proxies on a lightweight system, such as a MacBook Pro with a portable drive. When ready, move back to a beefier unit and storage, flip to original/optimized media, double-check all effects and color-correction on a good monitor, and then export the master files. It’s worth noting that this workflow is also potentially possible with Premiere Pro CC, because the new version to be introduced later this year will include a proxy editing workflow. Naturally there is no single solution, but Final Cut Pro X makes this process far easier than any other tool that I use. 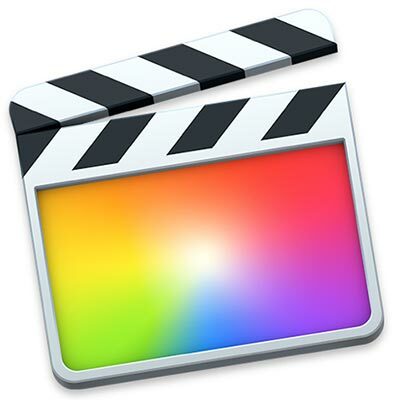 If 4K is increasingly looming on the horizon for you, then FCPX is certainly worth a test run. It’s often the little things that improve your editing workflow. Here are a few quick items that can expand your editing arsenal. The classical approach to editing transitions suggests that all you need is a cut and a dissolve. Given how often most editors use a dissolve transition, it’s amazing that few NLE developers spend any time creating more than a basic video dissolve, fade or dip. After all, even the original Media Composer came with both a video and a film-style dissolve. Audio mixers are used to several different types of crossfades. Since this is such a neglected area, the development team behind the Hawaiki plug-ins decided to create Super Dissolve – a dissolve transition plug-in for Final Cut Pro X with many more options. This installs through the FxFactory application. It shows up in the FCPX transitions palette as a dissolve effect, plus a set of presets for fades, dips and custom curves. A dissolve is nothing more than a blend between two images, so Super Dissolve exposes the same types of under-the-hood controls as After Effects and Photoshop artists are used to with compositing modes. Drop the Super Dissolve in as a transition and you have control over blending modes, layer order, easing controls with timing, and the blurring of the outgoing and/or incoming image. Since you have control over the outgoing and incoming clips separately, different values can be applied to either side, thus enabling an asymmetrical effect. For example, a quick fade with a blur off the outgoing clip, while bringing the incoming side up more slowly. As with the default FCPX dissolve, there’s also an audio crossfade adjustment, since FCPX transitions can effect both audio and video when these elements are combined. If you really like the ability to finesse your transitions, then Super Dissolve hits the spot. Free is good, so check out Idustrial Revolution’s free effects. Although they are primarily a video effects developer for Motion and Final Cut Pro X, they recently added a set of audio fade presets for FCPX. Download and install the free pack and you’ll find the XEffects Fades group in the audio plug-ins section of your effects palette. XEffects Fades includes a set of preset fade handles, which are applied to the audio on your timeline clips. Drag-and-drop the preset with the fade length closest to what you want and it automatically adjusts the fade handle length at both ends of that audio clip. If you want to tweak the length, apply the effect first and then adjust the length puck on the clip as needed. Existing lengths will be overwritten when you drop the effect onto the clip, so make sure you make these adjustments last. CrumplePop is another developer known for its video effects; but they, too have decided to add audio effects to their repertoire. 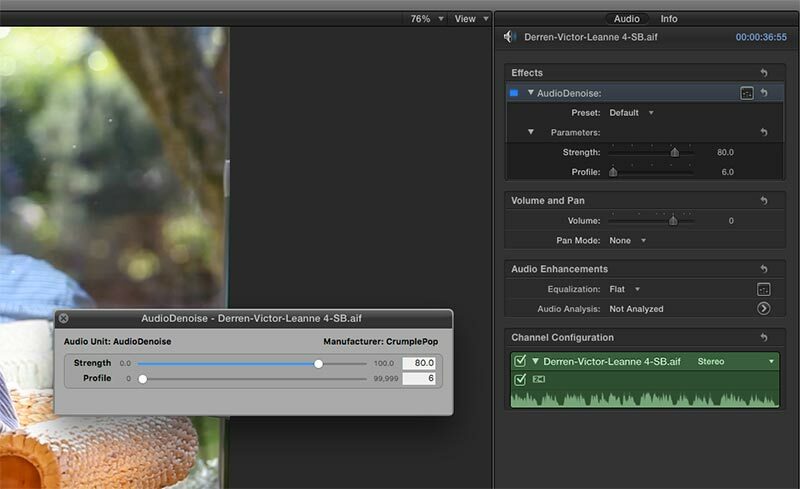 AudioDenoise and EchoRemover are two Final Cut Pro X plug-ins sold through the FxFactory application. These two effects are easy-to-use Apple Audio Units filters designed to improve poorly recorded location audio. As with Apple’s own built-in controls, each filter includes a few sliders to adjust strength and how the effect is applied. When applying any audio “clean up” filter, a little goes a long way. If you use it to its extreme range, the result sounds like you are underwater. Nevertheless, these two filters do a very nice job with poor audio, without presenting the cost and complexity of other well-known audio products. For a little bit of spice in your Final Cut Pro X timelines, it’s worth checking out the Alex4D Animated Transitions from FxFactory. Alex Gollner has been a prolific developer of free Final Cut Pro plug-ins, but this is his first commercial effort. Animated Transitions are a set of 120 customizable transition effects to slide, grow, split and peel incoming or outgoing clips and lower third titles. Traditionally you’d have to build these effects yourself using DVE moves. But by dropping one of these effects onto a cut point between two clips, you quickly apply a dynamic effect with all the work already done. Simply pick the transition you like, tweak the parameters and it’s done. One of the best features of Adobe applications is Extensions. This is a development “hook” within Premiere Pro or After Effects that allows developers to create task-oriented panels, tools and controls that effectively “bolt” right into the Adobe interface. One example for After Effects would be TypeMonkey (and the other “Monkeys”), which are kinetic effect macros. For Premiere there’s PDFviewer, which enables you to view your script (or any other document) in PDF format right inside the Premiere user interface. A new extension for Premiere Pro CC is Post Notes. Once installed, it’s an interface panel within Premiere Pro that functions as a combined notepad and to-do list. 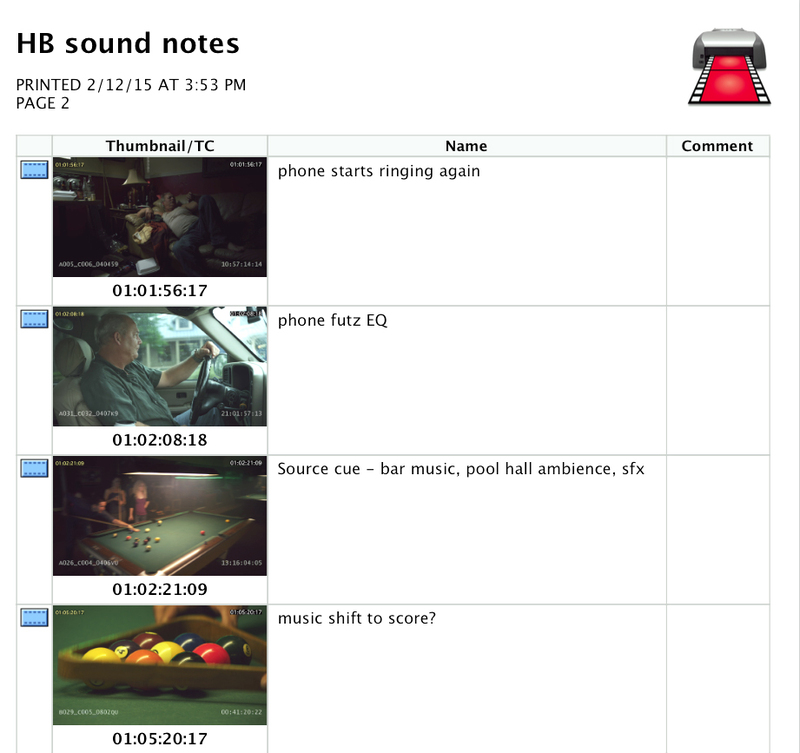 These are tied to a specific sequence, so you can have a set of notes and to-dos for each sequence in your project. When a to-do item is completed, check it off to indicate that it’s been addressed. This tool is so straightforward and simple, you’ll wonder why every editing software doesn’t already have something like this built-in. With digital media as a way of life for most editors, we have to deal with more and more camera media. Quickly copying camera cards is a necessary evil and making sure you do this without corruption is essential. The Mac Finder really is NOT the tool you should be using, yet everyone does it. There are a number of products on the market that copy to multiple locations with checksum verification. These are popular with DITs and “data wranglers” and include Pomfort Silverstack, Red Giant Offload, and even Adobe Prelude. A newcomer is Hedge for Mac. This is a simple, single-purpose utility designed to quickly copy files and verify the copies. There’s a free and a paid version. If you just want to copy to one or two destinations at a time, the free version will do. If you need even more destinations as a simultaneous copy, then go for the paid version. Hedge will also launch your custom AppleScripts to sort, transcode, rename or perform other functions. Transfers are fast in the testing I’ve done, so this is a must-have tool for any editors. Every nonlinear editing application is a database; however, Apple took this concept to a higher level when it launched Final Cut Pro X. One of its true strengths is making the organization of a mountain of media easier than ever. To get the best experience, an editor should approach the session holistically and not simply rely on FCP X to do all the heavy lifting. At the start of every new production, I set up and work within a specific folder structure. You can use an application like Post Haste to create a folder layout, pick up some templates online, like those from FDPTraining, or simply create your own template. No matter how you get there, the main folder for that production should include subfolders for camera files, audio, graphics, other media, production documents, and projects. This last folder would include your FCP X library, as well as others, like any After Effects or Motion projects. The objective is to end up with everything that you accrue for this production in a single master folder that you can archive upon completion. It helps to understand the Final Cut Pro X Library structure. The Library is what would otherwise be called a project file, but in FCP X terminology an edited sequence is referred to as a Project, while the main session/production file is the Library. Unlike previous versions and other NLEs, the Library is not a closed, binary data file. It is a package file that you can open and peruse, by right-clicking the Library icon and using the “show package contents” command. In there you will find various binary files (labeled CurrentVersion.fcpevent) along with a number of media folders. This structure is similar to the way Avid Media Composer project folders are organized on a hard drive. Since FCP X allows you to store imported, proxy, transcoded, and rendered media within the Library package, the media folders can be filled with actual media used for this production. When you pick this option your Library will grow quite large, but is completely under the application’s control, thus making the media management quite robust. Another option is to leave media files in their place. When this is selected the Library package’s media folders will contain aliases or shortcut links to the actual media files. These media files are located in one or more folders on your hard drive. In this case, your Library file will stay small and is easier to transfer between systems, since the actual audio and video files are externally located. I suggest spreading things out. For example, I’ll create my Library on one drive, the location of the autosaved back-up files on another, and my media on a third. This has the advantage of no single point of failure. 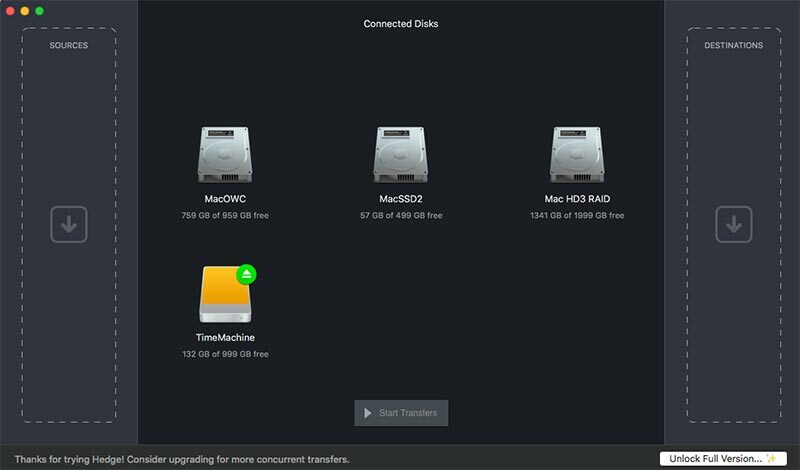 If the Library files are located on a drive that is backed up via Time Machine or some other system-wide “cloud” back-up utility, you have even more redundancy and protection. Following this practice, I typically do not place the Library file in the projects folder for the production, unless this is a RAID-5 (or better) drive array. If I don’t save it there during actual editing, then it is imperative to copy the Library into the project folder for archiving. The rub is that the package contains aliases, which certain software – particular LTO back-up software – does not like. My recommendation is to create a compressed archive (.zip) file for every project file (FCP X Library, AE project, Premiere Pro project, etc.) prior to the final archiving of that production. This will prevent conflicts caused by these aliases. If you have set up a method of organization that saves Libraries into different folders for each production, it is still possible to have a single folder, which shows you all the Libraries on your drives. To do this, create a Smart Folder in the Finder and set up the criteria to filter for FCP X Libraries. Any Library will automatically be filtered into this folder with a shortcut. Clicking on any of these files will launch FCP X and open to that Library. The first level of organization is getting everything into the appropriate folders on the hard drive. Camera files are usually organized by shoot date/location, camera, and card/reel/roll. Mac OS lets you label files with color-coded Finder tags, which enables another level of organization for the editor. As an example, you might have three different on-camera speakers in a production. You could label clips for each with a colored tag. Another example, might be to label all “circle takes” picked by the director in the field with a tag. The next step is to create a new FCP X Library. This is the equivalent of the FCP 7 project file. Typically you would use a single Library for an entire production, however, FCP X permits you to work with multiple open Libraries, just like you could have multiple projects open in FCP 7. In order to set up all external folder locations within FCP X, highlight the Library name and then in the Inspector panel choose “modify settings” for the storage locations listed in the Library Properties panel. Here you can designate whether media goes directly into the internal folders of the Library package or to other target folders that you assign. This step is similar to setting the Capture Scratch locations in FCP 7. 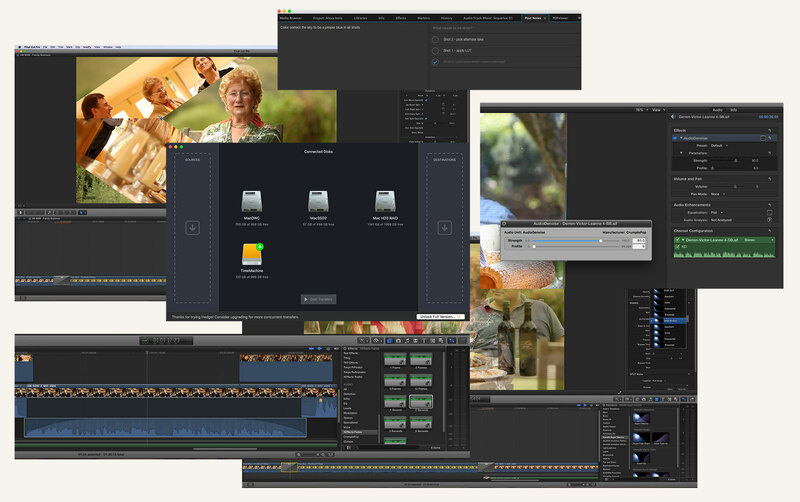 Final Cut Pro X organizes master source clips on three levels – Events, Keyword Collections, and Smart Collections. These are an equivalent to Bins in other NLEs, but don’t completely work in the same fashion. When clips are imported, they will go into a specific Event, which is closest in function to a Bin. It’s best to keep the number of Events low, since Keyword Collections work within an Event and not across multiple Events. I normally create individual Events for edited sequences, camera footage, audio, graphics, and a few more categories. Clips within an Event can be grouped in the browser display in different ways, such as by import date. This can be useful when you want to quickly find the last few files imported in a production that spans many days. Most of the time I set grouping and sorting to “none”. To organize clips within an Event, use Keywords. 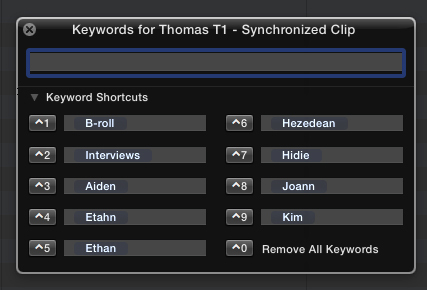 Setting a Keyword for a clip – or a range within a clip – is comparable to creating subclips in FCP 7. When you add a Keyword, that clip or range will automatically be sorted into a Keyword Collection with a matching name. Keywords can be assigned to keyboard hot keys, which creates a very quick way to go through every clip and assign it into a variety of Keyword Collections. Clips can be assigned to more than one Collection. Again, this is equivalent to creating subclips and placing them into separate Bins. On one set of commercials featuring company employees, I created Keyword Collections for each person, department, shoot date, store location, employees, managers, and general b-roll footage. This made it easy to derive spots that featured a diverse range of speakers. It also made it easy to locate a specific clip that the director or client might ask for, based on “I think Mary said that” or “It was shot at the Kansas City store”. Keyword Collections can be placed into folders. Collections for people by name went into one folder, Collections by location into another, and so on. 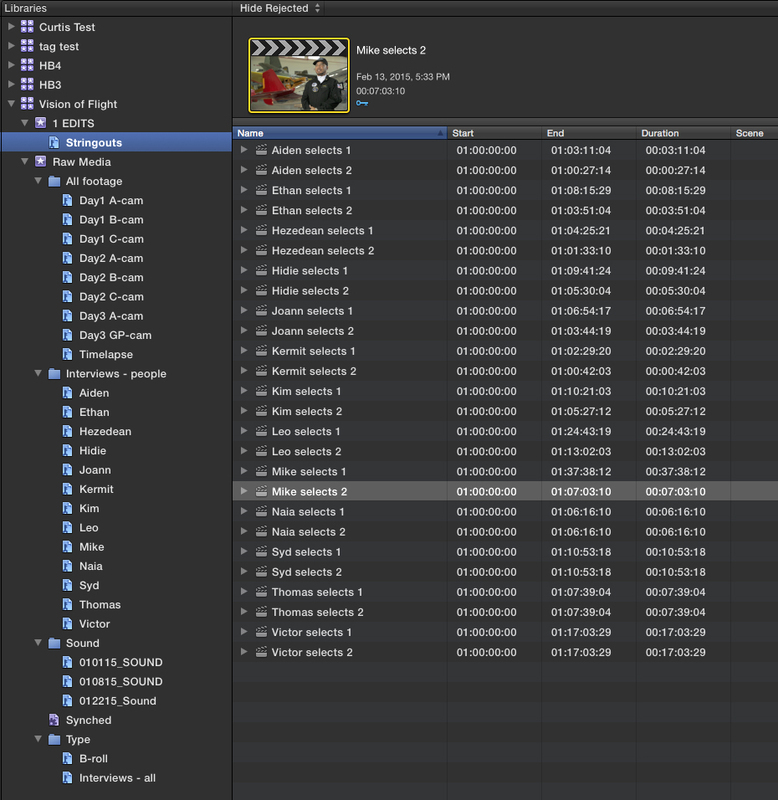 The beauty of Final Cut Pro X is that it works in tandem with any organization you’ve done in the Finder. If you spent the time to move clips into specific folders or you assigned color-coded Finder tags, then this information can be used when importing clips into FCP X. The import dialogue gives you the option to “leave files in place” and to use Finder folders and tags to automatically create corresponding Keyword Collections. Camera files that were organized into camera/date/card folders will automatically be placed into Keyword Collections that are organized in the same fashion. If you assigned clips with Mary, John, and Joe to have red, blue, and green tags for each person, then you’ll end up with those clips automatically placed into Keyword Collections named red, blue, and green. Once imported, simply rename the red, blue, and green Collections to Mary, John, and Joe. The third level of clip organization is Smart Collections. Use these to automatically filter clips based on the criteria that you set. With the release of FCP X version 10.2, Smart Collections have been moved from the Event level (10.1.4 or earlier) to the Library level – meaning that filtering can occur across multiple Events within the Library. By default, new Libraries are created with several preset Smart Collections that can be used, deleted, or modified. Here’s an example of how to use these. When you sync double-system sound clips or multiple cameras, new grouped clips are created – Synchronized Clips and Multicam Clips. These will appear in the Event along with all the other source files, which can be unwieldy. To focus strictly on these new grouped clips, create a Smart Collection with the criteria set by type to include these two categories. Then, as new grouped clips are created, they will automatically be filtered into this Smart Collection, thus reducing clutter for the editor. Final Cut Pro X was designed around a new paradigm, so it tends to live in its own world. Most professional editors have the need for a higher level of interoperability with other applications and with outside vendors. To aid in these functions, you’ll need to turn to third party applications from a handful of vendors that have focused on workflow productivity utilities for FCP X. These include Intelligent Assistance/Assisted Editing, XMiL, Spherico, Marquis Broadcast, and Thomas Szabo. Their utilities make it possible to go between FCP X and the outside world, through list formats like AAF, EDL, and XML. Final Cut’s only form of decision list exchange is FCPXML, which is a distinctly different data format than other forms of XML. Apple Logic Pro X, Blackmagic Design DaVinci Resolve and Autodesk Smoke can read it. Everything else requires a translated file and that’s where these independent developers come in. Once you use an application like XtoCC (formerly Xto7) from Intelligent Assistance to convert FCPXML to XML for an edited sequence, other possibilities are opened up. 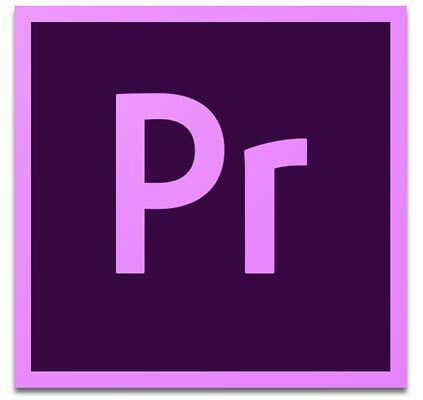 The translated XML file can now be brought into Adobe Premiere Pro or FCP 7. Or you can use other tools designed for FCP 7. For instance, I needed to generate a print-out of markers with comments and thumbnail images from a film, in order to hand off notes to the visual effects company. By bringing a converted XML file into Digital Heaven’s Final Print – originally designed with only the older Final Cut in mind – this became a doable task. Thomas Szabo has concentrated on some of the media functions that are still lacking with FCP X. Need to get to After Effects or Nuke? The ClipExporter and ClipExporter2 applications fit the bill. His newest tool is PrimariesExporter. This utility uses FCPXML to enable batch exports of clips from a timeline, a series of single-frame exports based on markers, or a list of clip metadata. Intelligent Assistance offers the widest set of tools for FCP X, including Producer’s Best Friend. This tool enables editors to create a range of reports needed on most major jobs. It delivers them in spreadsheet format. Understanding the thought processes behind FCP X and learning to use its powerful relational database will get you through complex projects in record time. Better yet, it gives you the confidence to know that no editorial stone was left unturned. 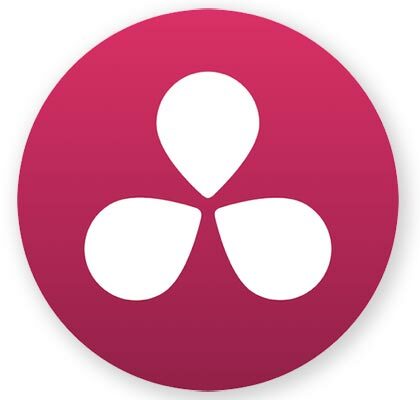 For more information on advanced workflows and organization with Final Cut Pro X, check out FCPworks, MacBreak Studio (hosted by Pixel Corps), Larry Jordan, Lynda.com and Ripple Training. For those that want to know more about the nuts and bolts of the post production workflow for feature films, check out Mike Matzdorff’s “Final Cut Pro X: Pro Workflow”, an iBook that’s a step-by-step advanced guide based on the lessons learned on Focus. Originally written for Digital Video magazine / CreativePlanetNetwork. Last October I wrote about the roundtrip workflow surrounding Final Cut Pro X and Resolve, particularly as it relates to working with RED camera files. This month I’ve been color grading a small, indie feature film shot with RED One cameras at 4K resolution. The timeline is 1080p. During the course of grading the film in DaVinci Resolve 11, I’ve encountered a number of issues in the roundtrip process. Here are some workflow steps that I’ve found to be successful. Step 1 – For the edit, transcode the RED files into 1080p Apple ProRes Proxy QuickTime movies baking in camera color metadata and added burn-in data for clip name and timecode. 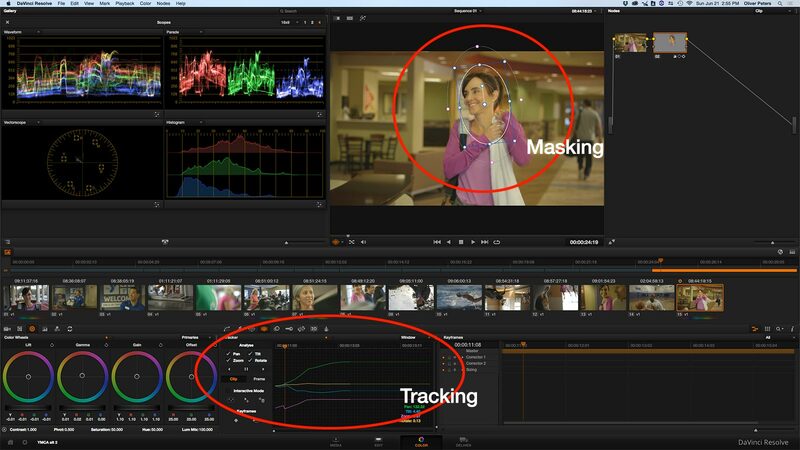 Use either REDCINE-X Pro or DaVinci Resolve for the transcode. Step 2 – Import the proxies and double-system audio (if used) into FCP X and sync within the application or use Sync-N-Link X. Ideally all cameras should record reference audio and timecode should match between the cameras and the sound recorder. Slates should also be used as a fall-back measure. 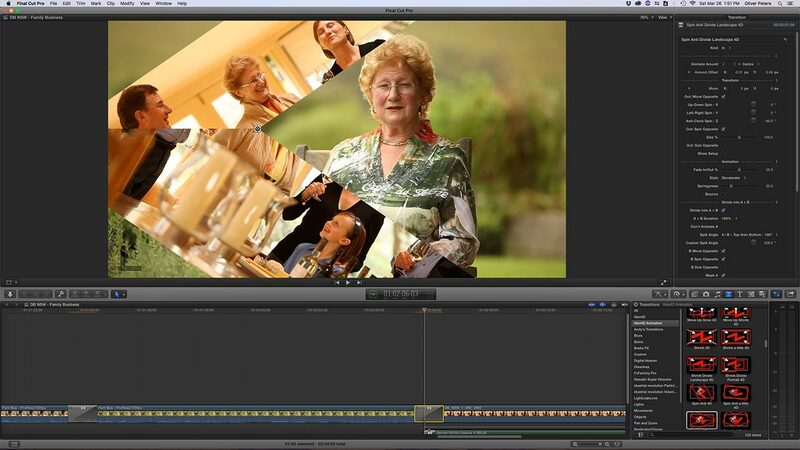 Step 3 – Edit in FCP X until you lock the cut. Prepare a duplicate sequence (Project) for grading. In that sequence, strip off (detach and remove) all audio. As an option, you can create a mix-down track for reference and attach it as a connected clip. Flatten the timeline down to the Primary Storyline where ever possible, so that Resolve only sees this as one track of video. Compound clips should be broken apart, effects should be removed, and titles removed. Audition clips should be finalized, but multicam clips are OK. Remove effects filters. Export an FCPXML (version 1.4 “previous”) list. 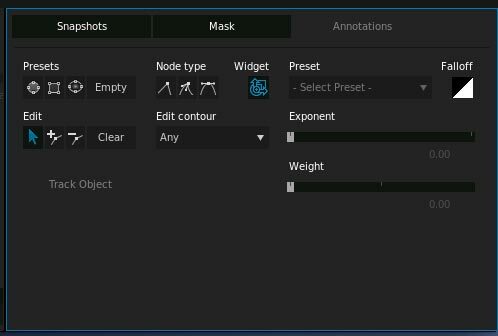 You should also export a self-contained reference version of the sequence, which can be used to check the conform in Resolve. Step 4 – Launch Resolve and make sure that the master project settings match that of your FCP X sequence. If it’s supposed to be 1920×1080 at 23.976 (23.98) fps, then make sure that’s set correctly. Resolve defaults to a frame rate of 24.0fps and that won’t work. Locate all of your camera original source media (RED camera files in this example) and add them to your media bin in the Media page. Import the FCPXML (1.4), but disable the setting to automatically load the media files in the import dialogue box. The FCPXML file will load and will relink to the RED files without issue if everything has gone correctly. 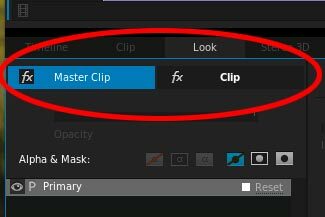 The timeline may have a few clip conflicts, so look for the little indicator on the clip corner in the Edit window timeline. If there’s a clip conflict, you’ll be presented with several choices. Pick the correct one and that will correct the conflict. Step 5 – At this point, you should verify that the files have conformed correctly by comparing against a self-contained reference file. 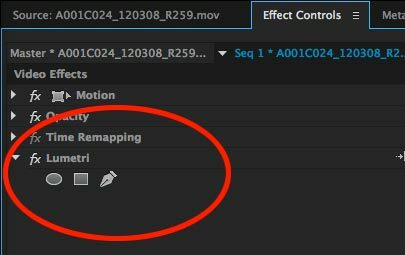 Compound clips can still be altered in Resolve by using the Decompose function in the timeline. This will break apart the nested compound clips onto separate video tracks. In general, reframing done in the edit will translate, as will image rotation; however, flips and flops won’t. To flip and flop an image in FCP X requires a negative X or Y scale value (unless you used a filter), which Resolve cannot achieve. When you run across these in Resolve, reset the scale value in the Edit page inspector to normal from that clip. Then in the Color page use the horizontal or vertical flip functions that are part of the resizing controls. Once this is all straight, you can grade. Step 6 option A – When grading is done, shift to the Deliver page. If your project is largely cuts-and-dissolves and you don’t anticipate further trimming or slipping of edit points in your NLE, then I would recommend exporting the timeline as a self-contained master file. You should do a complete quality check the exported media file to make sure there were no hiccups in the render. This file can then be brought back into any NLE and combined with the final mixed track to create the actual show master. In this case, there is no roundtrip procedure needed to get back into the NLE. Step 6 option B – If you anticipate additional editing of the graded files – or you used transitions or other effects that are unique to your NLE – then you’ll need to use the roundtrip “return” solution. 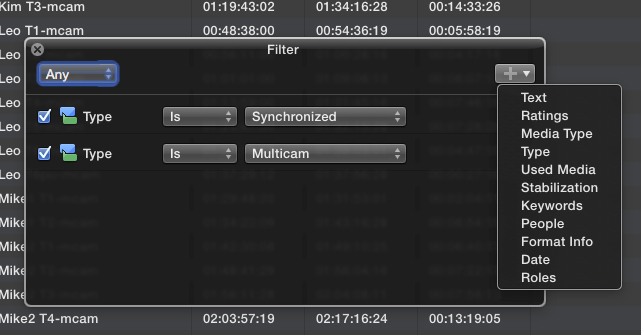 In the Deliver page, select the Final Cut Pro easy set-up roundtrip. This will render each clip as an individual file at the source or timeline resolution with a user-selected handle length added to the head and tail of each clip. Resolve will also write a corresponding FCPXML file (version 1.4). This file will retain the original transitions. 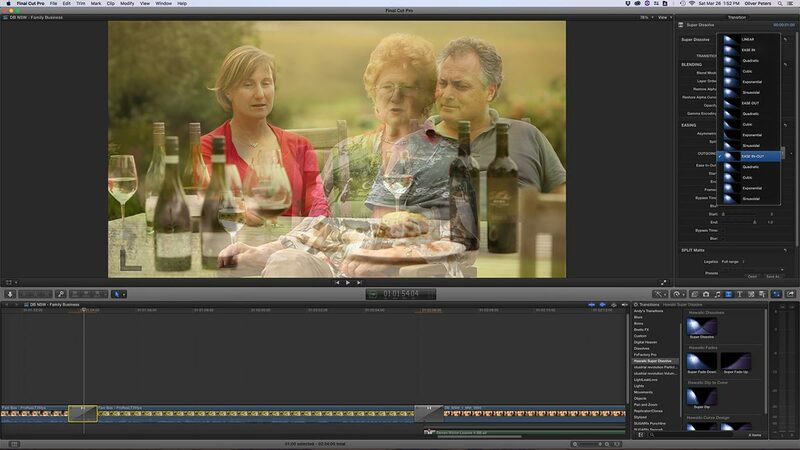 For example, if you used FCP X’s light noise transition, it will show up as a dissolve in Resolve’s timeline. When you go back to FCP X, it will retain the proper transition information in the list, so you’ll get back the light noise transition effect. Resolve generates this list with the assumption that the media files were rendered at source resolution and not timeline resolution. Therefore, even if your clips are now 1920×1080, the FCPXML represents these as 4K. When you import this new FCPXML back into FCP X, a spatial conform will be applied to “fit” the files into the 1920×1080 raster space of the timeline. Change this to “none” and the 1080 media files will be blown up to 4K. You can choose to simply live with this, leave it to “fit”, and render the files again on FCP X’s output – or follow the next step for a workaround. Step 7 – Create a new Resolve project, making sure the frame rate and timeline format are correct, such as 1920×1080 at 23.976fps. Load the new media files that were exported from Resolve into the media pool. Now import the FCPXML that Resolve has generated (uncheck the selection to automatically import media files and uncheck sizing information). The media will now be conformed to the timeline. From the Edit page, export another FCPXML 1.4 for that timeline (no additional rendering is required). This FCPXML will be updated to match the media file info for the new files – namely size, track configuration, and frame rate. At this stage, you will encounter a second serious flaw in the FCP X/Resolve/FCP X roundtrip process. Resolve 11 does not write a proper FCPXML file and leaves out certain critical asset information. You will encounter this if you move the media and lists between different machines, but not if all of the work is being done on a single workstation. 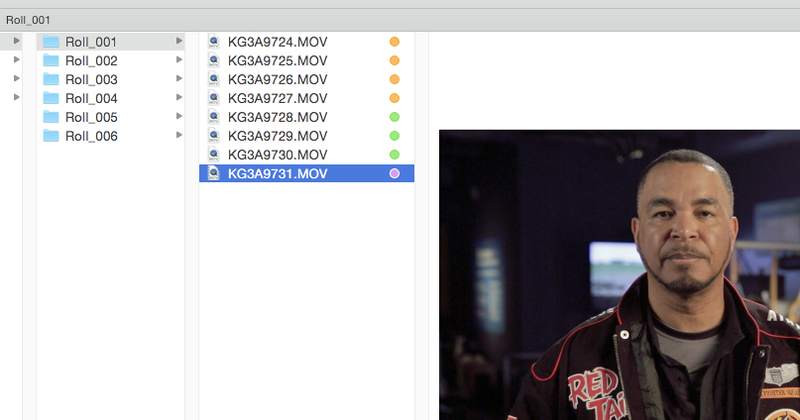 The result will be a timeline that loads into FCP X with black clips (not the red “missing” icon). When you attempt to reconnect the media, FCP X will fail to relink and will issue an “incompatible files” error message. To fix the problem, either the colorist must have FCP X installed on the Resolve system or the editor must have Resolve 11 installed on the FCP X system. This last step is the one remaining workaround. Step 8 option A – If FCP X is installed on the Resolve machine, import the FCPXML into FCP X and reconnect the media generated by Resolve. Then re-export a new FCPXML from FCP X. This new list and media can be moved to any other system. You can move the FCP X Library successfully, as well. Step 8 option B – If Resolve is installed on the FCP X machine, then follow Step 7. 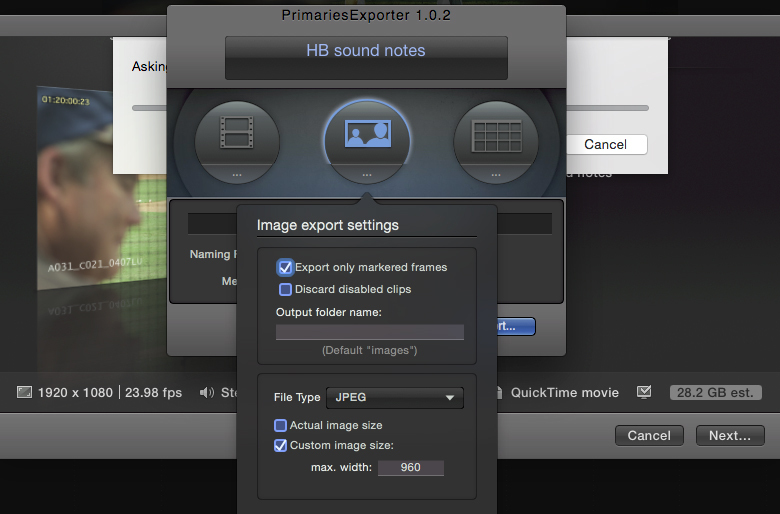 The new FCPXML that you create there will load into FCP X, since you are on the same system. That’s the state of things right now. Maybe some of these flaws will be fixed with Resolve 12, but I don’t know at this point. The FCPXML list format involves a bit of voodoo at times and this is one of those cases. The good news is that Resolve is very solid when it comes to relinking, which will save you. Good luck! 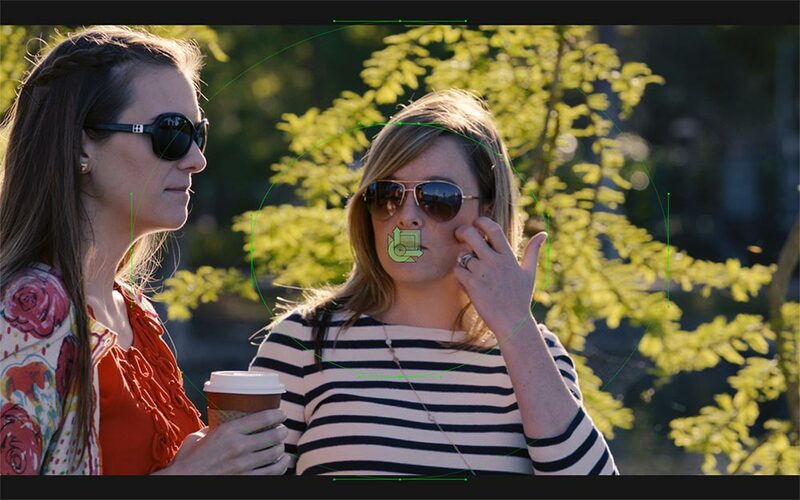 How you handle color correction depends on your temperament and level of expertise. Some editors want to stay within the NLE, so that editorial adjustments are easily made after grading. Others prefer the roundtrip to a powerful external application. When Adobe added the Direct Link conduit between Premiere Pro CC and SpeedGrade CC, they gave Premiere Pro editors the best of both worlds. SpeedGrade is a standalone grading application that was initially designed around an SDI feed from the GPU to a second monitor for your external video. 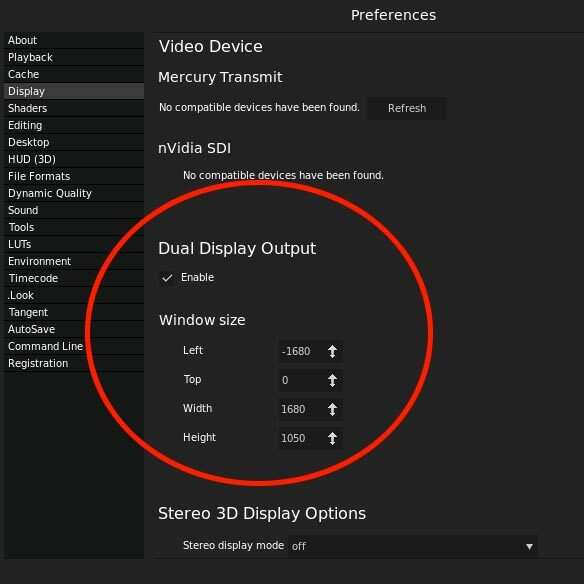 After the Adobe acquisition, Mercury Transmit was eventually added, so you can run SpeedGrade with one display, two computer displays, or a computer display plus a broadcast monitor. With a single display, the video viewer is integrated into the interface. At home, I use two computer displays, so by enabling a dual display layout, I get the SpeedGrade interface on one screen and the full-screen video viewer on the other. To do this you have to correctly offset the pixel dimensions and position for the secondary display in order to see it. Otherwise the image is hidden behind the interface. Using Mercury Transmit, the viewer image is sent to an external monitor, but you’ll need an appropriate capture/monitoring card or device. AJA products seem to work fine. Some Blackmagic devices work and others don’t. When this works, you will lose the viewer from the interface, so it’s best to have the external display close – as in next to your interface monitor. 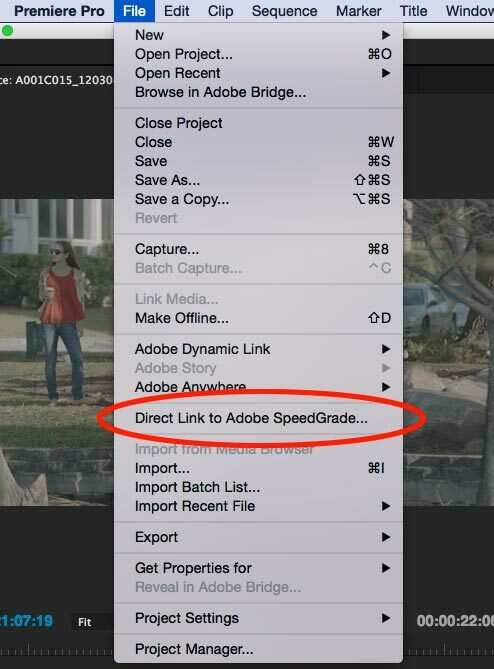 When you use Direct Link, you are actually sending the Premiere Pro timeline to SpeedGrade. This means that edits and timeline video layers are determined by Premiere Pro and those editing functions are disabled in SpeedGrade. It IS the Premiere Pro timeline. This means certain formats that might not be natively supported by a standalone SpeedGrade project will be supported via the Direct Link path – as long as Premiere Pro natively supports them. There is a symbiotic relationship between Premiere Pro and SpeedGrade. For example, I worked on a music video that was edited natively using RED camera media. The editor had done a lot of reframing from the native 4K media in the 1080 timeline. All of this geometry was correctly interpreted by SpeedGrade. When I compared the same sequence in Resolve (using an XML roundtrip), the geometry was all wrong. SpeedGrade doesn’t give you access to the camera raw settings for the .r3d media, but Premiere Pro does. So in this case, I adjusted the camera raw values by using the source settings control in Premiere Pro, which then carried those adjustments over to SpeedGrade. Since the Premiere Pro timeline is the SpeedGrade timeline when you use Direct Link, you can add elements into the sequence from Premiere, in order to make them available in SpeedGrade. Let’s say you want to add a common edge vignette across all the clips of your sequence. Simply add an adjustment layer to a top track while in Premiere. This appears in your SpeedGrade timeline, enabling you to add a mask and correction within the adjustment layer clip. In addition, any video effects filters that you’ve applied in Premiere will show up in SpeedGrade. You don’t have access to the controls, but you will see the results interactively as you make color correction adjustments. All SpeedGrade color correction values are applied to the clip as a single Lumetri effect when you send the timeline back to Premiere Pro. All grading layers are collapsed into a single composite effect per clip, which appears in the clip’s effect stack (in Premiere Pro) along with all other filters. In this way you can easily trim edit points without regard to the color correction. Traditional roundtrips render new media with baked-in color correction values. There, you can only work within the boundaries of the handles that you’ve added to the file upon rendering. Not so with Direct Link, since color correction is like any other effect applied to the original media. Any editorial changes you’ve made in Premiere Pro are reflected in SpeedGrade should you go back for tweaks, as long as you continue to use Direct Link. Most editors are familiar with 3-way color correctors that have level and balance controls for shadows, midrange and highlights. Many refer to SpeedGrade’s color correction model as a 12-way color corrector. The grading interface features a 3-way (lift/gamma/gain) control for four ranges of correction: overall, shadows, midrange, and highlights. Each tab also adds control of contrast, pivot, color temperature, magenta (tint), and saturation. Since shadow, midrange, and highlight ranges overlap, you also have sliders that adjust the overlap thresholds between shadow and midrange and between the midrange and highlight areas. Color correction is layer based – similar to Photoshop or After Effects. SpeedGrade features primary (“P”) , secondary (“S”) and filter layers (the “+” symbol). When you add layers, they are stacked from bottom to top and each layer includes an opacity control. 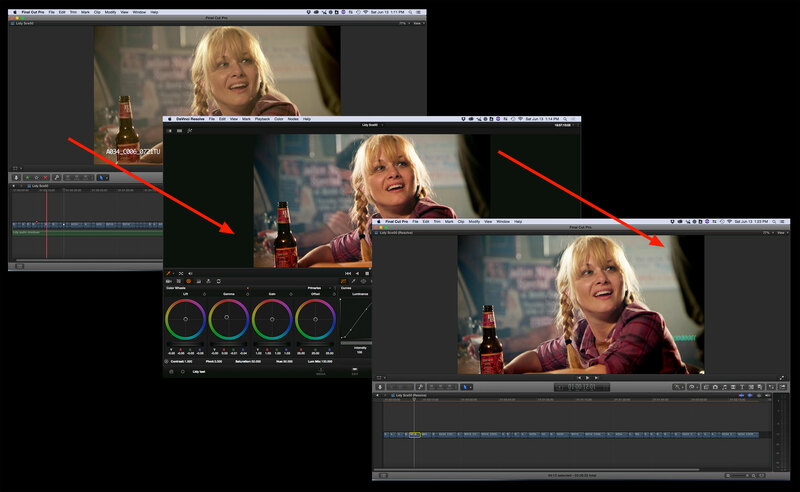 As such, layers work much the same as rooms in Apple Color or nodes in DaVinci Resolve. You can create a multi-layered adjustment by using a series of stacked primary layers. Shape masks, like that for a vignette, should be applied to a primary layer. The mask may be normal or inverted so that the correction is applied either to the inside or the outside of the mask. Secondaries should be reserved for HSL keys. For instance, highlighting the skin tones of a face to adjust its color separately from the rest of the image. 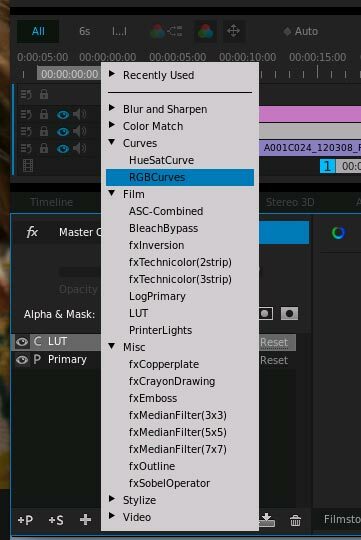 The filter layer (“+”) is where you’ll find a number of useful tools, including Photoshop-style creative effect filters, LUTs, and curves. The application of color correction can be applied to a clip as either a master clip correction or just a clip correction (or both). When you grade using the default clip tab, then that color correction is only being applied to that single clip. If you grade in the master clip tab, then any color correction that you apply to that clip will also be applied to every other instance of that same media file elsewhere on the timeline. Theoretically, in a multicam edit – made up of four cameras with a single media file per camera – you could grade the entire timeline by simply color correcting the first clip for each of the four cameras as a master clip correction. All other clips would automatically inherit the same settings. Of course, that almost never works out quite as perfectly, therefore, you can grade a clip using both the master clip and the regular clip tabs. Use the master for a general setting and still use the regular clip tab to tweak each shot as needed. Grades can be saved and recalled as Lumetri Looks, but typically these aren’t as useful in actual grading as standard copy-and-paste functions – a recent addition to SpeedGrade CC. Simply highlight one or more layers of a graded clip and press copy (cmd+c on a Mac). Then paste (cmd+v on a Mac) those to the target clip. These will be pasted in a stack on top of the default, blank primary correction that’s there on every clip. You can choose to use, ignore, or delete this extra primary layer. SpeedGrade features a cool trick to facilitate shot matching. The timeline playhead can be broken out into multiple playheads, which will enable you to compare two or more shots in real-time on the viewer. This quick comparison lets you make adjustments to each to get a closer match in context with the surrounding shots. Everyone has their own approach to grading and these days there’s a lot of focus on camera and creative LUTs. My suggestions for prepping a Premiere Pro CC sequence for SpeedGrade CC go something like this. Once, you are largely done with the editing, collapse all multicam clips and flatten the timeline as much as possible down to the bottom video layer. Add one or two video tracks with adjustment layers, depending on what you want to do in the grade. These should be above the last video layer. All graphics – like lower thirds – should be on tracks above the adjustment layer tracks. This is assuming that you don’t want to include these in the color correction. Now duplicate the sequence and delete the tracks with the graphics from the dupe. Send the dupe to SpeedGrade CC via Direct Link. In SpeedGrade, ignore the first primary layer and add a filter layer (“+”) above it. Select a camera patch LUT. For example, an ARRI Log-C-to-Rec-709 LUT for Log-C gamma-encoded Alexa footage. Repeat this for every clip from the same camera type. If you intend to use a creative LUT, like one of the SpeedLooks from LookLabs, you’ll need one of their camera patches. This shifts the camera video into a unified gamma profile optimized for their creative LUTs. If all of the footage used in the timeline came from the same camera and used the same gamma profile, then in the case of SpeedLooks, you could apply the creative LUT to one the adjustment layer clips. This will apply that LUT to everything in the sequence. 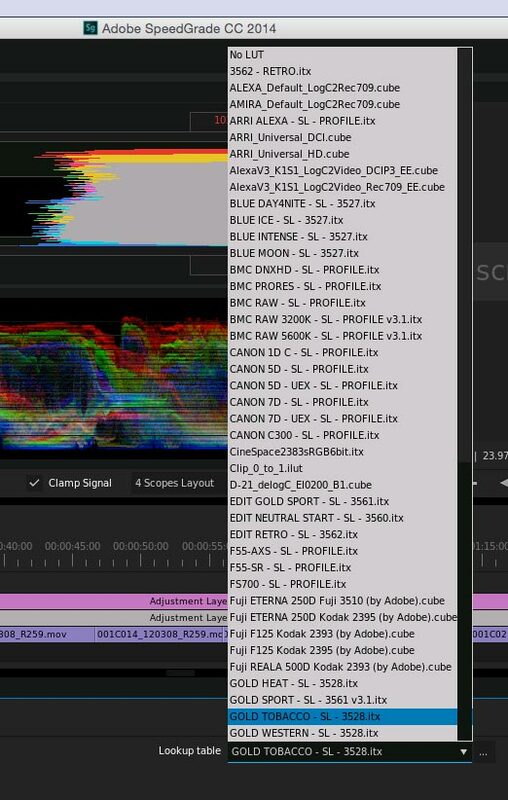 Once you’ve applied input and output LUTs you can grade each clip as you’d like, using primary and secondary layers. Use filter layers for curves. Any order and any number of layers per clip is fine. Using this methodology all grading is happening between the camera patch LUT and the creative LUT added to the adjustment layer track. Finally, if you want a soft edge vignette on all clips, apply an edge mask to the default primary layer of the topmost adjustment layer clip. Adjust the size, shape, and softness of the mask. Darken the outside of the mask area. Done. Now simply send your timeline back to Premiere Pro (the “Pr” button). Back in Premiere Pro CC, duplicate that sequence. Copy-and-paste the graphics tracks from the original sequence to the available blank tracks of the copy. When done, you’ll have three sequences: 1) non-color corrected with graphics, 2) color corrected without graphics, and 3) final with color correction and graphics. The beauty of the Direct Link path between Premiere Pro CC and SpeedGrade CC is that you can easily go back and forth for changes without ever being locked in at any point in the process.